Jimmy Fallon seems to have settled into his role as the host of The Tonight Show, in fact, he might even be getting a little too comfortable. The comedian and late-night talk show host seems to have fallen into a pattern of using the same joke, like, way too many times. As YouTube user Tim Lefler points out in a cleverly edited new video, Fallon has been leaning on the same joke during the show's "Screengrabs" segment. The concept for the segment is simple enough — show captcha codes that spell out rude or funny words ("weiner hound," "genital robberies," "big ho"). Fallon's problem is that the bit he's been repeating over and over again wasn't even that great in the first place. He starts off by explaining what a captcha is ("You know, those squiggly words you type in before you buy tickets to a concert or something?") — sounding equally unsure of his description every time. Then he reveals the silly word combo. Then he looks over his shoulder, gives his voice a nasal affectation and says, "Honey, I'm gonna get those [insert generic pop star name] tickets]," before adding, "Don't come in here!" when he remembers the phrase that's on his screen. If it sounds not that funny, it's because it isn't. 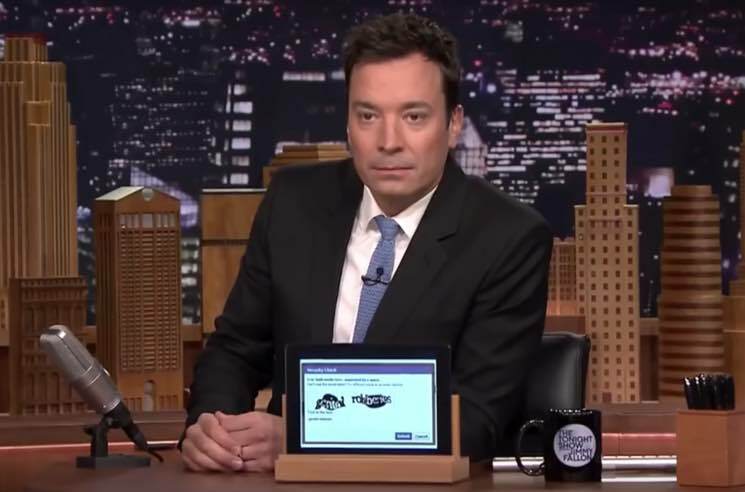 Nevertheless, watch Fallon do the same bit way too many times in the video below.